HONOLULU — Hawaii’s Democratic lawmakers on Thursday criticized Attorney General Jeff Sessions after he expressed amazement on a radio show that a “judge sitting on an island in the Pacific” could stop the president’s travel ban. U.S. Sen. Mazie Hirono responded by trying to give Sessions a civics lesson on Twitter, saying Hawaii has been a U.S. state for 58 years. The senator said later in a telephone interview the remarks showed a lack of awareness about the separation of powers between the judiciary and executive branches. U.S. District Judge Derrick Watson last month blocked President Donald Trump’s executive order prohibiting new visas for people from six Muslim-majority countries and temporarily halting the U.S. refugee program. The Trump Administration appealed the ruling. Sessions told the “Mark Levin Show” he’s confident the president will prevail with his administration’s appeal of Watson’s travel ban ruling. Hirono also said Sessions’ remarks suggested he is prejudiced against Hawaii. “Why isn’t a federal judge from Hawaii as able as any other judge from anywhere to issue rulings?” Hirono asked. Both Hirono and Sen. Brian Schatz emphasized that Sessions voted as a senator to confirm Watson as a judge. Schatz chided Sessions more on Twitter by telling him the island where Watson made the ruling is named Oahu. “It’s my home. Have some respect,” he said. 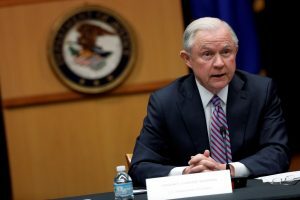 U.S. Justice Department spokesman Ian Prior said in an email that Sessions was questioning one judge’s ability to block the president’s executive order for the travel ban. READ MORE: A Hawaii judge just extended a ruling to block Trump’s travel ban. What’s next?